If you're feeling like you're in the need for a denim drawer refresh, then now's the perfect time to switch it up and invest in a pair of mom jeans. The relaxed-fit style, which typically hits at or above the waist, is a great alternative to loose-fit jeans or fitted skinnies. They're just as easy to wear and look great when paired with a casual tee or a refined blouse-and-blazer combo—so yes, there are tons of ways you can wear them, and you can switch up the styling depending on the occasion. Ready to see our favorite mom-jean outfits for winter? Ahead, we've rounded up some of the best denim looks and included simple styling tips for how you can emulate each. Read on for all the mom jean inspiration you could ever want this season; then scoop up a few new pairs for yourself. Tuck in a fitted knit. Style the mom jeans with a funky top and a check blazer. Style cropped mom jeans with colorful booties. A cropped cardigan and high-top Converse are a great addition. Go for a denim-on-denim look, and add in crisp white booties to contrast the dark jean wash. Pick a pair of mom jeans in a versatile wash. This is certain to become your new go-to: a sweater, mom jeans, and easy slip-on mules. 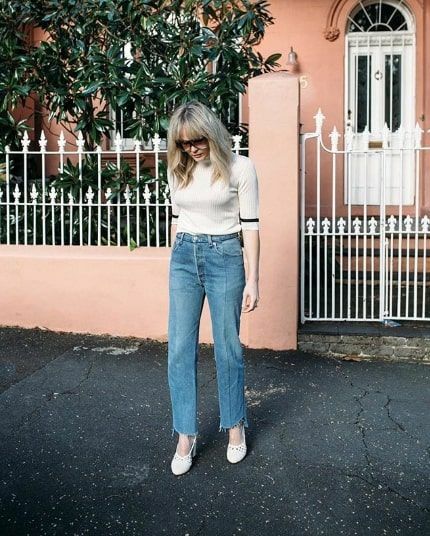 Swap a tucked-in top for a cropped one when you have a high-waisted pair of mom jeans. Wear this mom-jean outfit for a day of shopping or your upcoming travels. An easy pair you can wear year-round. Patch detailing always makes jeans look instantly cooler. Prefer a more affordable option? This pair from Topshop is a great alternative. Pair these with a black turtleneck bodysuit, white booties, and an oversize leather jacket. Try a pair of mom jeans in black. Name a jean brand more classic than Levi's? Next up, check out the best winter outfits with sleek black jeans.